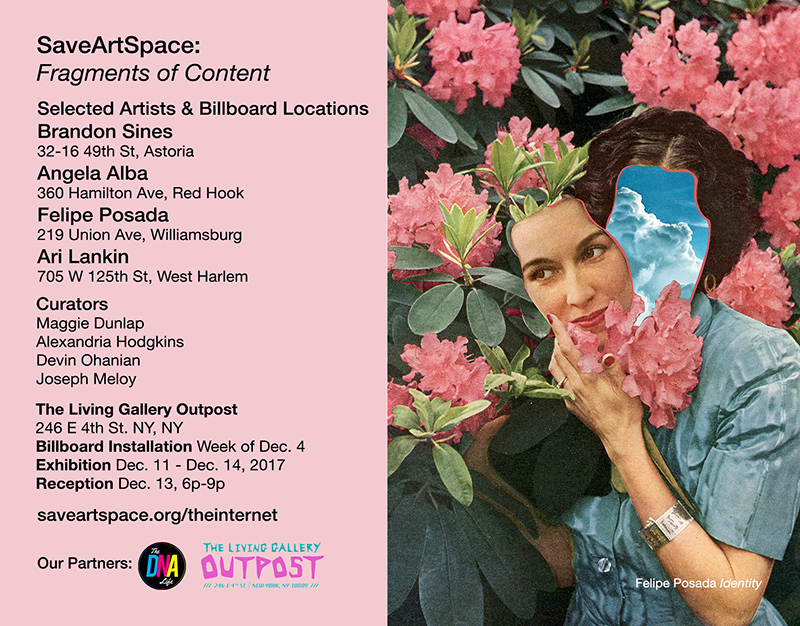 SaveArtSpace brings more public art to New York City, showcasing artists on advertising spaces throughout the area beginning December 4, 2017. The selected artists will also be exhibited at The Living Gallery Outpost, with an opening reception on December 13, 2017. An qualified panel of curators considered each submission's pertinence to the theme of the exhibition, the context of the images and association to the public space. The curators are Devin Ohanian of The DNA Life; Alexandria Hodkins, & Joseph Meloy of The Living Gallery Outpost; and Independent Curator, Maggie Dunlap. All submissions will be featured on SaveArtSpace social media pages with the permission of the artist. SaveArtSpace has held previous Public Art Exhibitions in New York City, Los Angeles, Miami, Louisville, and Golden, Co. Shortly after moving to New York City in 2010, Brandon Sines combined his use of mythological creatures, pop icons, and made up characters into a new character called Frank. Frank is an "ape" that often takes the form of a cartoon, but is no doubt a reference to Sines himself. Frank explores human issues without human restrictions. With Frank, he had found a way to bring the autobiographical undertones in his work to the surface with a playful character who was instantly accessible to everyone. Much like New York enables both anonymity and stardom, Frank gave Sines the ability to be invisible yet fully present in his work. This added a deeper sincerity to his paintings which enables viewers to connect with his work on a highly personal level. "It's important for me to be able to laugh at myself when it comes to mistakes and embarrassments. This feeling is something that I want to relay in my work, and I'm happy if I'm able to make at least one other person laugh about it too." Artist." 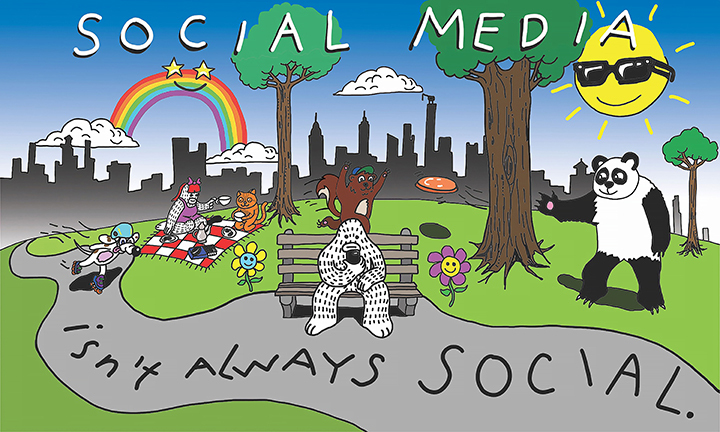 Angela’s work mimics the dry humor in which millennials engage on social media through dating apps, sharing memes, gifs, videos, and photos. With an emphasis on soft pastel colors, she incorporates intuitively bent neon, a sporadic use of spray foam, and wet looking resin, creating a grotesque, intestinal quality on a surface. The subjects of femininity, the reality of melancholy, and humor are recurring themes in her work. Angela currently works from her studio at Brooklyn Art Space in Gowanus. Connect on Instagram at @angelaalba_. The Invisible Realm is home to Felipe Posada, Visual Artist and Creative Director working in the fields of Digital Collage, Motion Design, Film, Branding and Advertising. With an MFA with emphasis in Motion Graphics from the Savannah College of Art and Design (2004) for over than a decade, Felipe has worked commercially as a Designer, Animator, and Creative Director, leading teams and developing the most surreal and innovative projects for advertising agencies, content studios, brands and world-known artists. Through The Invisible Realm Felipe started a personal journey to develop a body of artwork that explores his most intimate feelings, thoughts and beliefs as well as exercises his sense of aesthetics. Felipe lives and works from his studio in Brooklyn NYC. My artwork is a journey through the invisible realm: a dimension where intuition, memories, visions and dreams are free to take visual form. Through my art I revisit concepts that have fascinated me, scared me and intrigued me since I was a child. The results, often unpredictable, are compositions filled with symbolism and hidden meaning. Topics such as metaphysics, mythology, space exploration, sacred geometry, anthroposophy, the Goddess can often be found in my artwork, sometimes infused with a dash of retrofuturistic nostalgia and mixed in with the inevitable influence of pop culture that engulfs us. Size: 28 in x 40 in, Framed. Connect on Instagram at @the_invisible_realm. Artist Bio/Statement: Over the last decade Ari Lankin has extensively developed painted languages exploring abstraction, concepts, and realism. His current paintings are intentionally open to interpretation and rich in visual sensation. They hover on a slippery line between mystical and scientific. Paint handling, invention, and exploration of the picture plane are crucial aspects of his search. His interest in other artists and art history is passionate. Education and curation are important aspects of his practice. Lankin lives in Manhattan where he has had his studio for over a decade. Connect on Instagram at @arilankin.